We are always happy to receive donations which both enhance and fill gaps in our collections. Recently, we were sent a copy of ‘Kids from Over the Water: An Edwardian working-class childhood in south-east London’ by Angela Cousins. This book is based on the memoires of one of Angela’s aunt, Keturah, who lived in Walworth in south-east London, having moved there from Bearstead, near Maidstone in Kent as a young child. Keturah Daveney began writing her memoire in 1977, when she was eighty-two to provide an account of her early life Walworth where she had lived from 1900, when she was five years old, until her marriage in 1917. 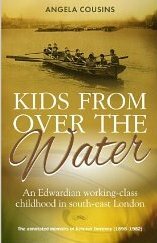 ‘Kids from over the water…’ details the lives of working-class Londoners in the early years of the century and provides a real insight into the vagaries of breadline living, including details of employment, education and public health at that time. If you are interested in memoires and historical accounts, this could be a very engaging read!